Do you know how I know that Christmas is approaching? My agenda has exploded into a frenzy of activity! Sandwiched in between my impending final exams, carolling gigs, work, dress rehearsals and concerts to sing at and attend... there is little time for anything else. However, I know that it would not be Christmas if I wasn't insanely busy. Also, it wouldn't be Christmas without proper Christmas music, or in my case, it wouldn't be Christmas without a candlelight procession. I remember my first year of choir we held our Christmas concert in the newly opened Francis Winspear Centre. It is a gorgeous venue. Up until that point, I had never sang for an audience of any sort so it was just staggering enter such a majestic auditorium. As well, that is where I was first introduced to the the concept of a candlelight procession. I was quite proud of the fact that my choir was old enough to use actual candles and not the candle flashlights the primary choirs were given. Take that 6-year-olds! 2. Keep hair product use to a minimum. 5. 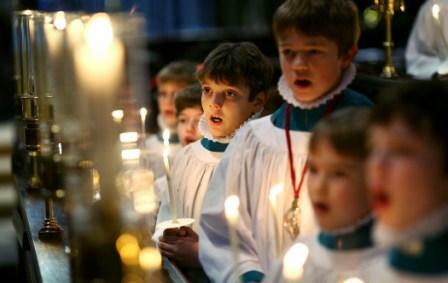 Memorise the music/carols since it is difficult to hold both a candle and an open binder. Plus, I find holding a binder ruins the silhouette of a chorister on stage during a candlelight procession. You should be creating an atmosphere of ethereal beauty, not reminding the audience that you don't know the words to basic carols. Of course, there are many other rules but these are some that came to my mind. If the above steps are obeyed, you will have a very satisfying candlelight procession experience indeed. My inner chorister craves a good candlelight procession every year. There's just something about entering a dim venue, angelic-sounding voices singing carols, with only the glowing-warm candlelight illuminating the space. For me, it's one of the perfect Christmas scenes. I urge you all to make sure you head out to watch something Christmassy this year because it really isn't Christmas without music. It's so easy to get caught up in the stress of the holidays that it's important to take time to enjoy the things we like. 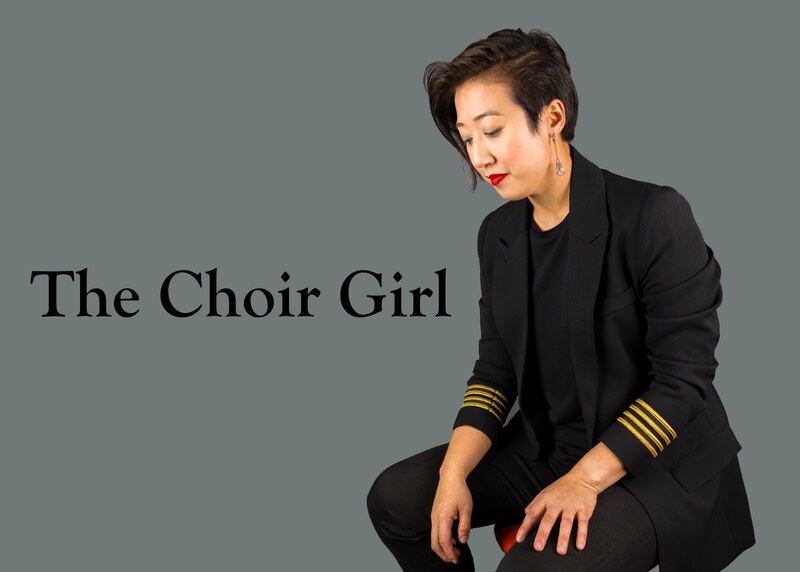 I will leave you readers with that lovely thought and if any of you happen to be in Edmonton and want to see me in my candlelight glory, come check out the Cantilon Christmas concert. 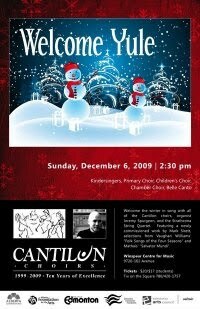 Welcome the winter in song with all of the Cantilon Choir, organist Jeremy Spurgeon, and the Strathcona String Quartet. Featuring a newly commissioned work by Mark Sirett, selections from Vaughan Williams' "Folk Songs for the Four Seasons" and Mathais' "Salvator Mundi". Kindersingers, Primary Choir, Children's Choir, Chamber Choir, Belle Canto. Oh that I lived close to Edmonton . . . alas I do not. Like the candle procession tips . . .
one thing that always tickles me when watching people light one candle from another is that nine times out of ten the person with the lit candle tries to light the unlit candle by tipping their flame to the unlit wick when it is far more efficacious to tip the unlit wick into the flame of the lit candle; and as for not holding lit candles perpendicular!! End of grump, carry on.